The attractive feature is the latest attraction at the Green Flag park which already boasts toddlers and older children’s play areas, a green gym and café. 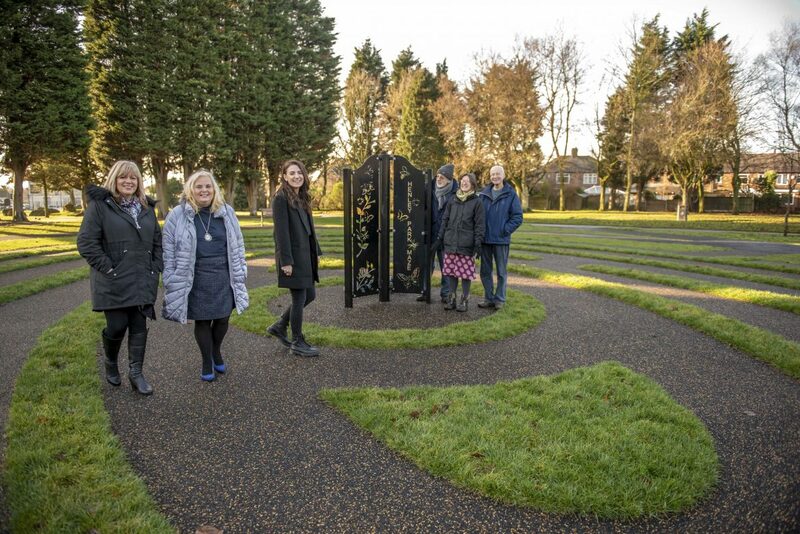 The latest addition, which includes a central sculpture and landscaped grassed area in the style of a maze, will now provide park visitors with a peaceful place to escape the busy pace of everyday life. The project has been driven by the Friends of Henley Park who secured funding from WREN’s FCC Community Action Fund and a contribution from Knowsley Council to fund the project. Local children from Waverton Nursery and residents at Willowbrook Hospice took part in art activities to design the garden sculpture. The ‘Friends’ and local residents were keen for this area to become a space for contemplation and wellbeing, as well as creating a space for children to explore and play. The Henley Park Café has now re-opened under new management and is open from 8am-4pm, seven days a week and is serving hot and cold drinks and a selection of hot and cold food. Pictured: (L-R): Cllr Shelley Powell, Knowsley Council’s Cabinet Member for Neighbourhoods visits the maze garden with fellow borough councillors Denise Allen, Steff O’Keeffe, and Maurice Handley, from the Friends of Henley Park, Cath Sheil, Knowsley Council and Cllr Mike Delaney, Whiston Town Council.